I've been hard at work on this piece which was created using Manga Studio software and Adobe Illustrator, for other elements to add in, at the original size of 10 by 15 approximately. This illustration is now available on my online store at Society 6. This illustration of the 'God of Epee' is based on the ties between classical and modern fencing throughout history. 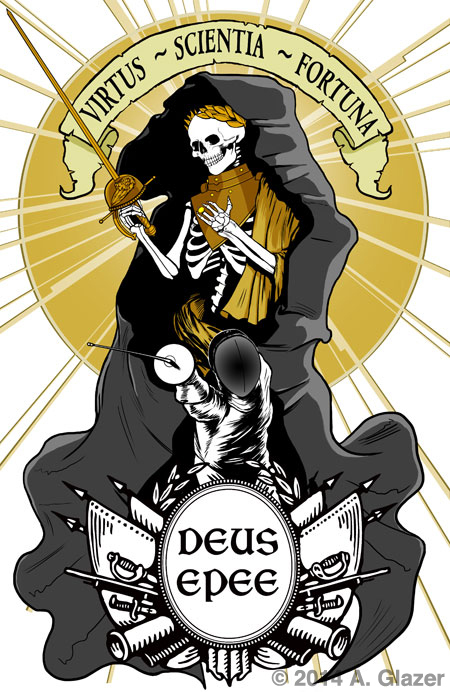 It represents the fictional patron god of this weapon class with the latin motto: Virtus, Scientia, Fortuna that translates to Valor, Skill and Fortune respectively. The idea is to honor the concept of Master to Apprentice with the knowledge of fencing being passed on, not too different from the other crafts in the Arts or any other related field. And so this patron god bestows the powers of mastery or becomes the 'idealized gold standard' in the history of Rapier sword-fighting that was the basis for the Epee weapon of today's modern fencing. 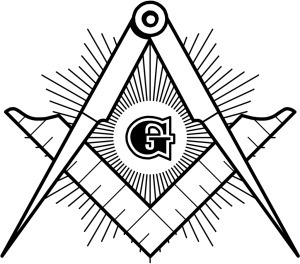 Masonic symbol. The Compass and the Ruler framing the G with the rays behind it.It's especially interesting that the Freemasons employed the use of the Master and Apprentice ( or Entered Apprentice until promoted to Master Mason as the highest ). Not only that, back in the renaissance, there were craftsmen employed in many skills from the arts in visual, music, black smithing, tailoring, and many more. Of course, fencing masters were also around at the time and had apprentices to pass their knowledge down to and this ancient art of defense is still ingrained into the modern sports of fencing, but also in other branches of Historical European Martial Arts or Re-enactment groups in choreographed duels. I plan on having two more patron gods of fencing in the near future in Foil and Saber.